Landed estate papers are an invaluable source for family and local historians - read more. The first two tables below contains links to material relating to North and Mid Antrim and Co. Londonderry as a whole. This is then followed by examples of some estates in North Antrim and South Derry. Agnew Estate: maps of some of the townlands on the estate with names of tenants, 1788 [PRONI: T2309/1]. Those townlands marked * will not appear in the later nineteenth-century lists of official townlands. Their names will still appear on Ordnance Survey maps as subdenominations of newer, larger townlands - see townland map. During the 1830s Tumoke and Mullan became part of the new townland of Magheraboy Upper. Ballymacwilliam and Killogue, along with the smaller townland of Crosstagherty, made up the new townland of Crosstagherty. 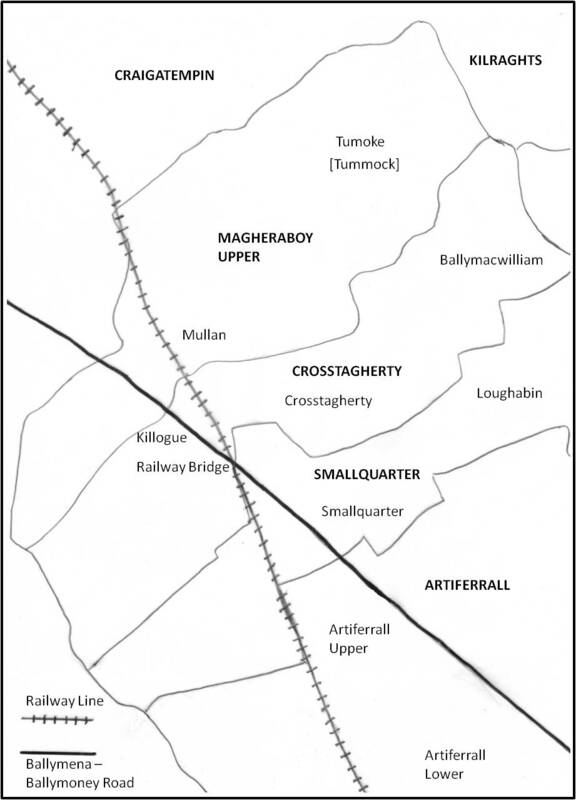 Likewise the smaller Smallquarter and Loughabin made up the newer townland of Smallquarter. Note also that in the nineteenth century local people would often give these older placenames as their address on marriage, birth and death certificates. Hutchinson Estate: maps of townlands with names of tenants, 1805 [PRONI: D408/1]. Killyramer & Dungorbery Calheme Dunaghy Greenshields . Montgomery Estate: maps of some of the townlands with names of tenants, 1788 [PRONI: T1638,21/1]. There is also a Rent Roll of the Estates of Hugh Montgomery 1810-1815 [PRONI: T1638/31/2]. See also - 1734 Map of the Town of Ballymoney with a list of tenants by street - by surname. BELLAGHY ESTATE IN SOUTH DERRY - read more.